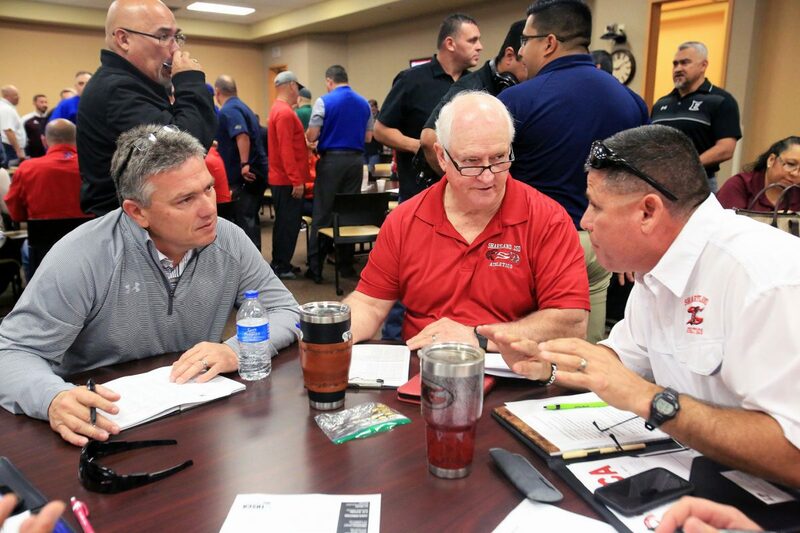 Sharyland Pioneer head football coach Tom Lee, left, Sharyland ISD Athletic Director, Richard Thompson, center, and Sharyland High head football coach Ron Adam Jr. have a discussion as coaches and athletic directors attend a UIL Realignment meeting at the Region One Education Service Center Thursday, Feb. 1, 2018, in Edinburg. A natural rivalry exists between the McAllen Memorial Mustangs and the PSJA North Raiders. Mustangs head football coach Bill Littleton will face his son, Raiders defensive coordinator Will Littleton, and North head coach Marcus Kaufmann served as Memorial’s offensive coordinator for 14 years before taking the job with the Raiders. The new District 30-6A, announced Tuesday when the UIL unveiled its district alignments for the 2018-2020 academic years, includes PSJA North, McAllen Memorial, McAllen Rowe and McAllen High, along with Mission High, PSJA High, La Joya High and La Joya Juarez-Lincoln. PSJA High and North are the two newcomers to the district, with La Joya Palmview leaving 30-6A and dropping to Class 5A. PSJA High coach Lupe Rodriguez is excited about facing Mission High, his alma mater. Rodriguez had a standout career with the Eagles, playing on some of the best teams in program history and making deep playoff runs. He also spent eight years coaching at Mission Veterans and four years with Mission High. Weslaco East head football coach Michael Burget has a discussion as he sits next to Donna North head football coach Joe Marichalar, second from left, and Edinburg Economedes head football coach Michael Saenz as coaches and athletic directors attend a UIL Realignment meeting at the Region One Education Service Center Thursday, Feb. 1, 2018, in Edinburg. 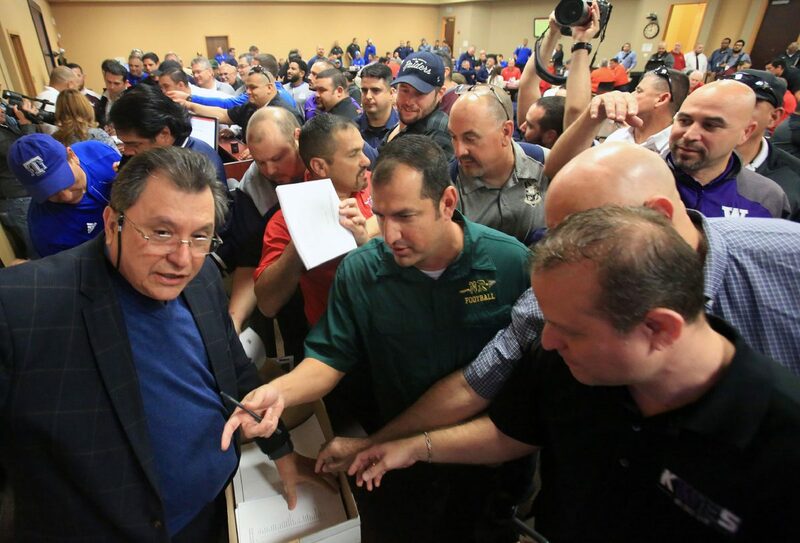 Dr. Cornelio Gonzalez, Executive Director at Region One, left, hands out UIL District Assignments and Reclassification Information packets as McAllen Rowe head football coach Bobby Flores, center, and other coaches and athletic directors reaches for them during a UIL Realignment meeting at the Region One Education Service Center Thursday, Feb. 1, 2018, in Edinburg. 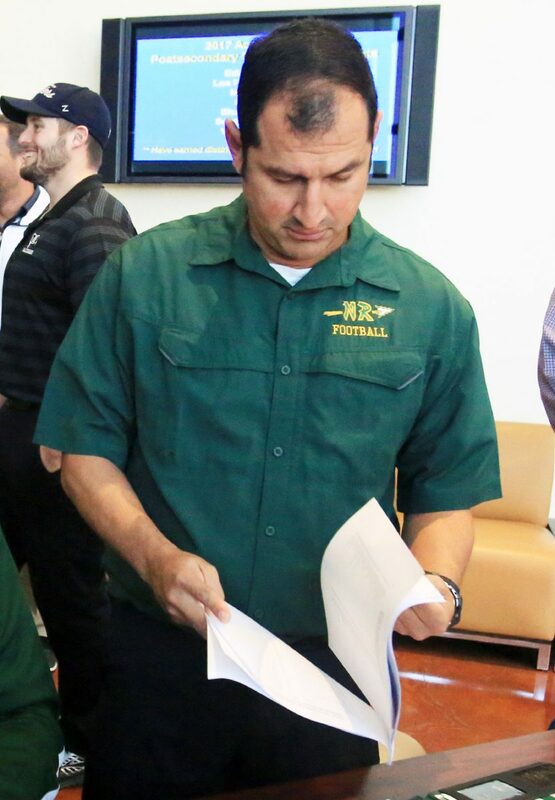 McAllen Rowe head football coach Bobby Flores looks over a UIL District Assignments and Reclassification Information packet as coaches and athletic directors attend a UIL Realignment meeting at the Region One Education Service Center Thursday, Feb. 1, 2018, in Edinburg. 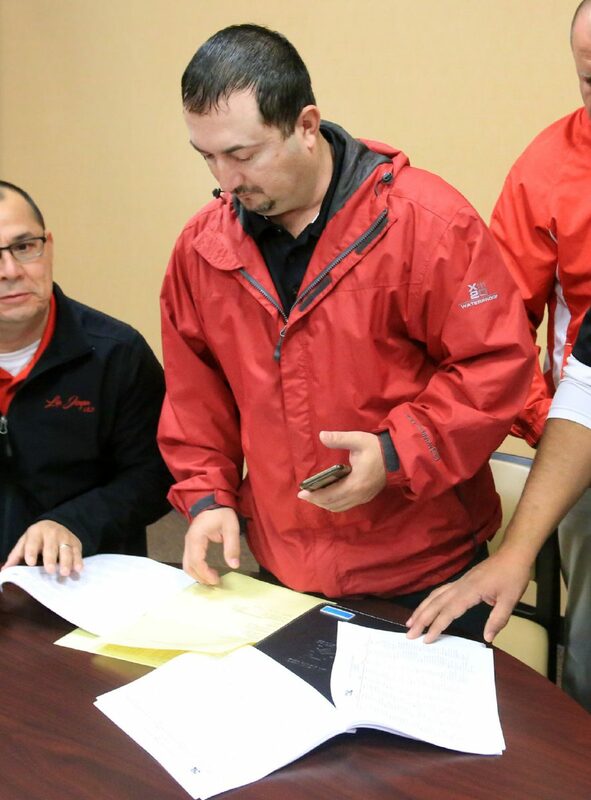 La Joya Palmview head football coach Margarito Requenez looks over a UIL District Assignments and Reclassification Information packet as coaches and athletic directors attend a UIL Realignment meeting at the Region One Education Service Center Thursday, Feb. 1, 2018, in Edinburg. 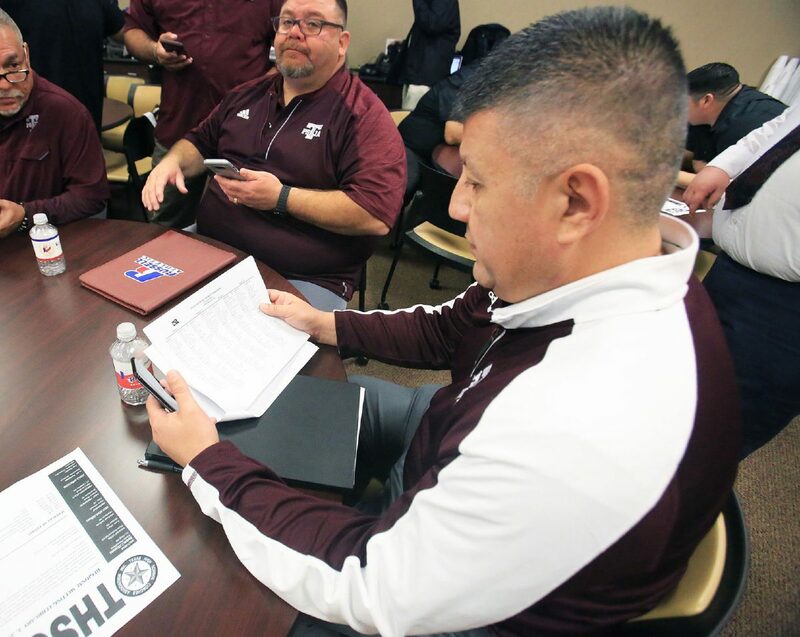 PSJA High head football coach Lupe Rodriguez looks over a UIL District Assignments and Reclassification Information packet as coaches and athletic directors attend a UIL Realignment meeting at the Region One Education Service Center Thursday, Feb. 1, 2018, in Edinburg. 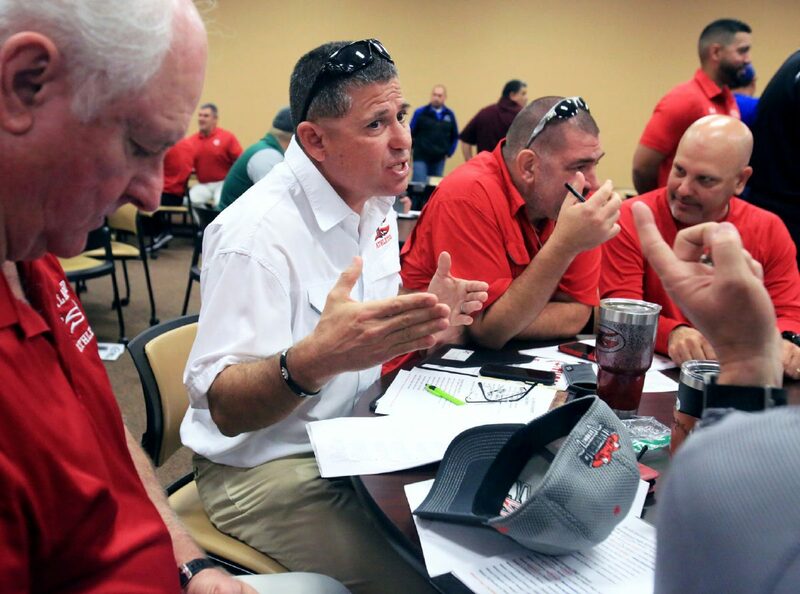 Sharyland High head football coach Ron Adame as a discussion as coaches and athletic directors attend a UIL Realignment meeting at the Region One Education Service Center Thursday, Feb. 1, 2018, in Edinburg. 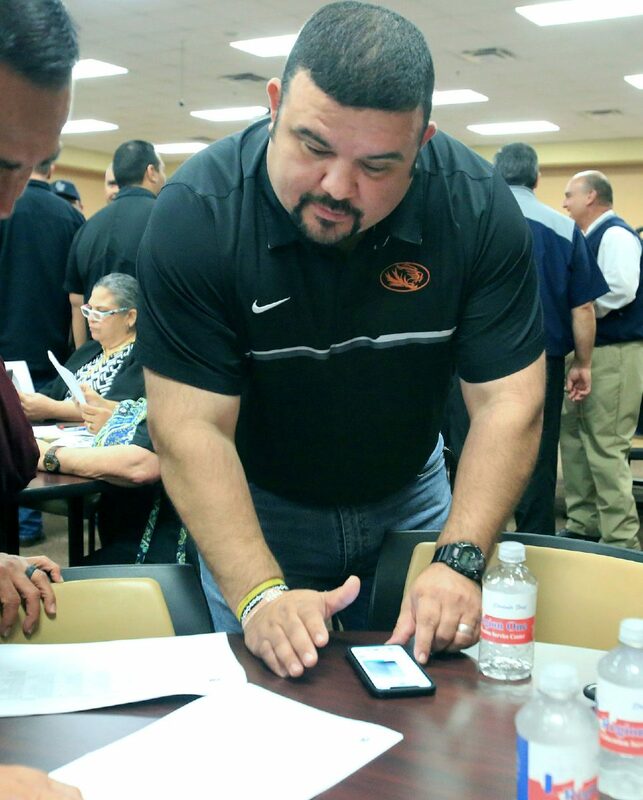 Mercedes head football coach Roger Adame Jr. looks over the UIL District Assignments and Reclassification Information packet as coaches and athletic directors attend a UIL Realignment meeting at the Region One Education Service Center Thursday, Feb. 1, 2018, in Edinburg. 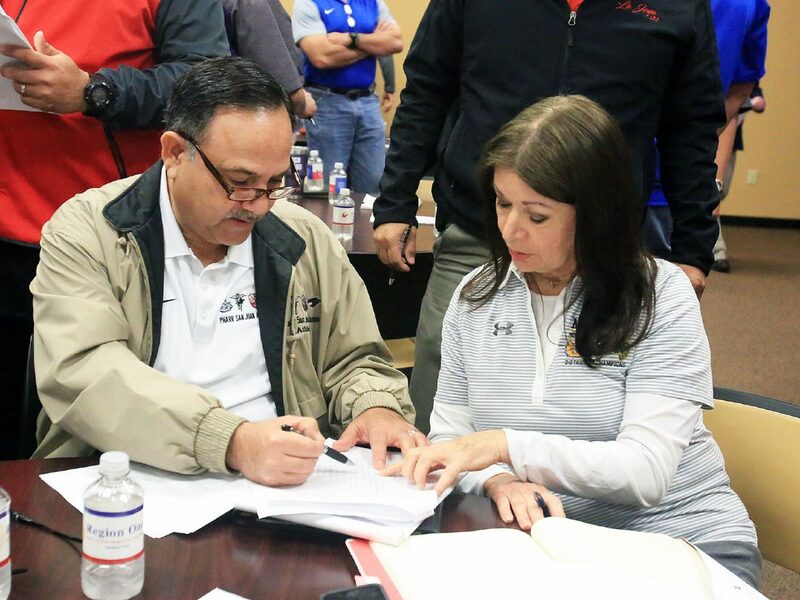 PSJA ISD Athletic Director Orlando Garcia, left, and McAllen ISD Athletic Director Paula Gonzalez have a discussion while looking over a UIL District Assignments and Reclassification Information packet as coaches and athletic directors attend a UIL Realignment meeting at the Region One Education Service Center Thursday, Feb. 1, 2018, in Edinburg. 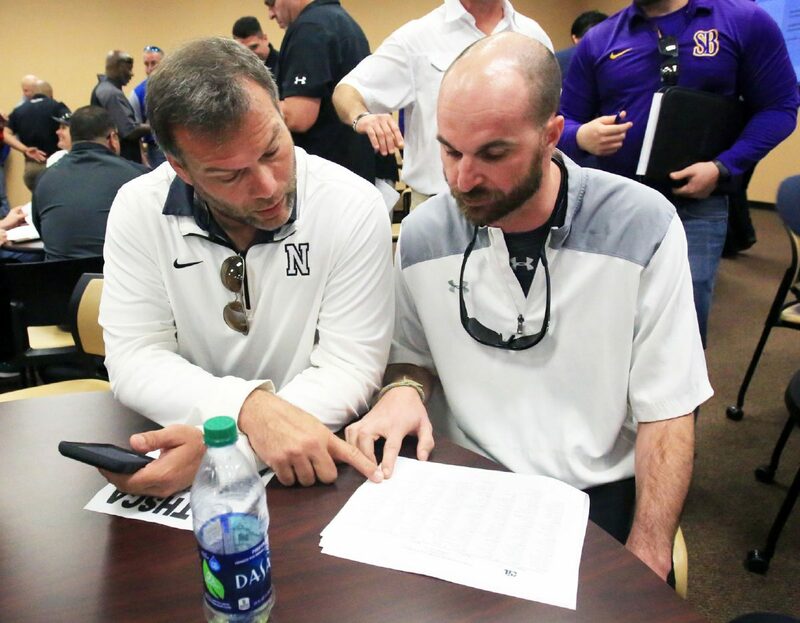 PSJA North head football coach Marcus Kaufmann, left, has a discussion with PSJA North assistant football coach Will Littleton while they look over a UIL District Assignments and Reclassification Information packet as coaches and athletic directors attend a UIL Realignment meeting at the Region One Education Service Center Thursday, Feb. 1, 2018, in Edinburg. 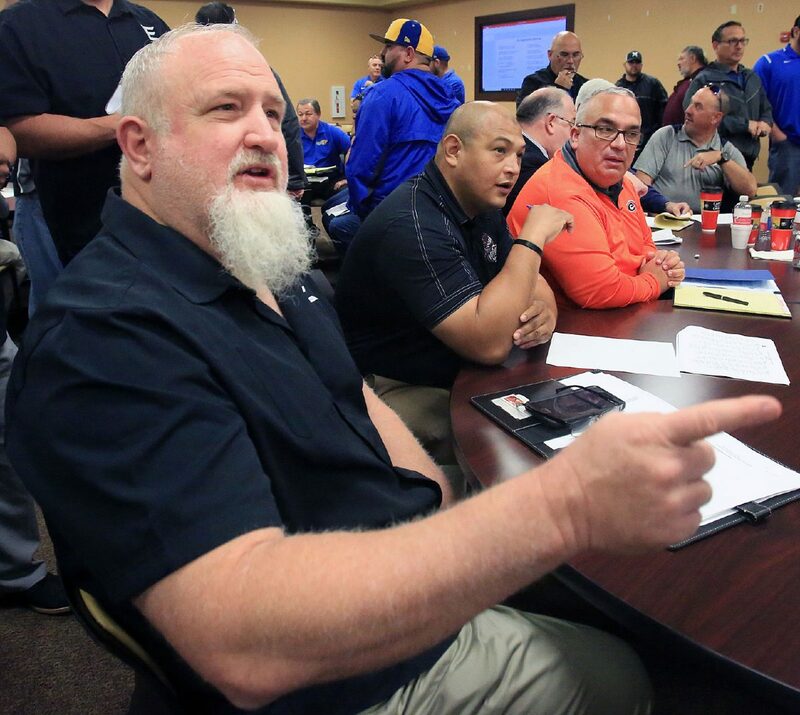 Donna North head football coach Joe Marichalar takes a UIL District Assignments and Reclassification Information packet as coaches and athletic directors attend a UIL Realignment meeting at the Region One Education Service Center Thursday, Feb. 1, 2018, in Edinburg. PSJA High will face only PSJA North out of the three other PSJA ISD schools. With 5A schools PSJA Memorial and PSJA Southwest scheduling only one non-district game, Rodriguez chose to focus on luring tough competition during his non-district slate. Edinburg’s four high schools will remain in District 31-6A but will welcome Weslaco High, Weslaco East and new 6A Donna North. 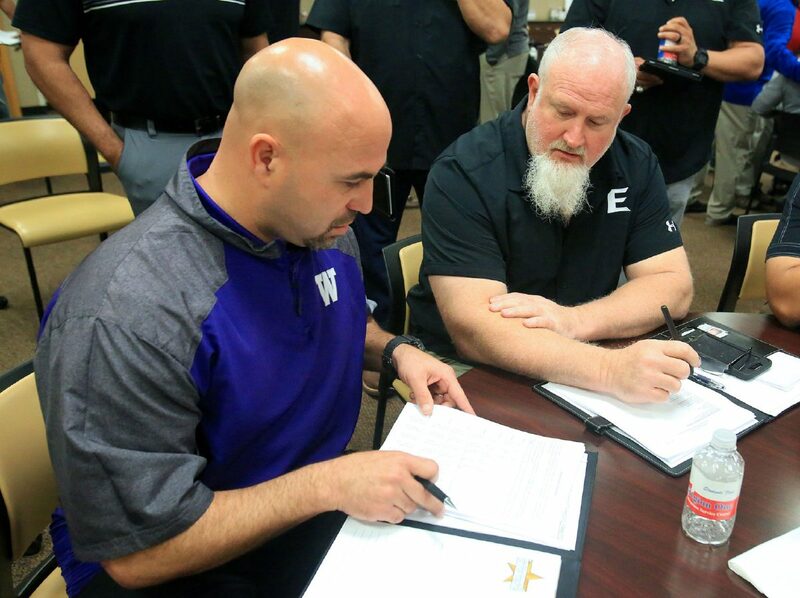 Mike Burget, who has helped build a successful program at Weslaco East, was excited to move back into a similar district as the 2014-15 seasons, when East was with three Edinburg schools and two PSJA squads. Weslaco East and Edinburg Vela have had some classic battles over the past few years in the playoffs, and that rivalry could heat up as two of the best teams in the Rio Grande Valley will now share a district. Burget was hesitant to call anyone a favorite in February. The Valley’s 21 Class 6A teams were divided into three districts: an eight-team District 30-6A, a seven-team District 31-6A and a six-team District 32-6A. 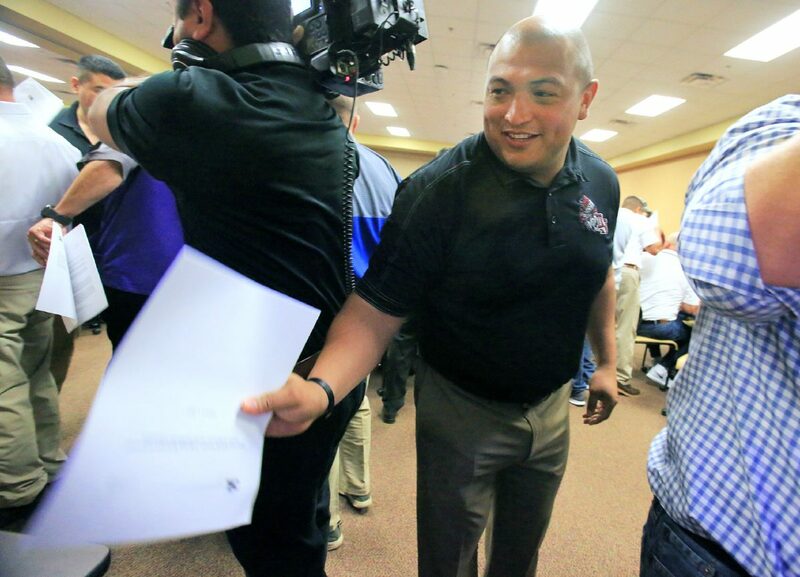 Edinburg High coach J.J. Leija was excited for the challenge of the new district. Edinburg High will play Harlingen South, Brownsville Rivera, Juarez-Lincoln and Mercedes in non-district competition. Edinburg Vela also has a tough non-district schedule with games against Laredo United, Brownsville Hanna and Los Fresnos. The game circled on the calendar is a Week 3 meeting with McAllen Memorial. The new alignment pits Weslaco High coach Michael Salinas against Vela, the team he coached for five years until leaving at the end of the 2016 season. Donna North was already tasked with adjusting to life in 6A with a new coach, but the Chiefs received no breaks in the realignment. North coach Joe Marichalar is ready for the challenge. The Valley’s remaining Class 6A teams are from the Lower Valley. Brownsville Rivera, Brownsville Hanna, Harlingen High, Harlingen South, Los Fresnos and San Benito will form a six-team District 32-6A.